There’s a reason why HostGator takes up 1% of all Internet traffic. It services websites big and small and provides convenience for webmasters of all skill-levels. If the name HostGator sounds familiar, it’s probably due to large advertising campaigns that propelled HostGator into the limelight since it’s launch in 2002. HostGator has become one of the biggest web hosting companies out there, with 9 million domains under its belt. It’s no wonder why HostGator is so popular. With competitive prices and tempting perks and plans, HostGator provides an answer for small businesses, as well as large enterprises. Every plan offers unlimited disk space, bandwidth and a push forward for a greener world by offsetting CO2 emissions, using Wind Power. Want to know if HostGator is right for you? Different plans by HostGator will provide you many important functions, such as unlimited bandwidth and disc space, emails, subdomains and MySQL databases. Along with these great features, you’ll have access to many other convenient tools, like ready-to-install CMS platforms, free credits for Google AdWords, Website Builder, etc. With a very impressive 99.9% uptime guaranteed, HostGator insures a high level of reliability. HostGator’s uptime guarantee relies upon a powerful and well manned system, operating behind your screen. With monitoring systems in place, servers are regularly checked. Their secure data center has restricted and limited access, so this is very reassuring. All monitoring is done over a 24/7/365 period and backups are usually completed weekly to allow you to roll back in case you run into a problem. HostGator’s migrations team is on call to transfer your existing content from your previous host and configure it to perform flawlessly on HostGator’s platform. Domain registrations may be transferred as well, so you can administer your entire online portfolio in one place! HostGator walks you every step of the way, both in the process of signing up for the services, configuring your website, or checking out tutorials. When choosing a plan, you can quickly see the pricing and even use a manual slider to create the site with exact specifications in mind. 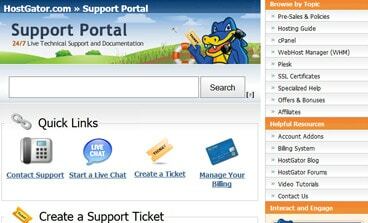 HostGator management is done using the latest cPanel version. It is very easy to use, via links to regularly accessed areas like Webmail grouped together at the top left. The SEO and Marketing Tools are clearly labeled and offer an extensive array of ways to get your site noticed. Numerous tutorials will also help you to better understand many web hosting principles and functions. All packages include 24/7 phone support, in addition to live chat, and ticketed (email) problems. There is also a user forum with more than 600 video tutorials and even a snail-mail address. If all of the above fail to succeed, HostGator promises CEO Brett Oxley will personally answer your ticket. Sounds great? HostGator has a price point for nearly every type of webmaster, plus lots of coupon codes to entice you to join. While there are no contracts, the longer you commit the cheaper the price will get. You can subscribe for up to 3 years ahead and enjoy amazing discounts, especially for the Hatchling Plan. All prices and features available at HostGator are listed at the registration stage, so you can adjust your parameters and quickly select the best deal for you. Moreover, you get a 45 Day Money back Guarantee, which is a good way to check if this web host matches your requirements. onClick="trackClickout('event', 'clickout', 'Vendor Page - Visit User Reviews', 'HostGator', this, true);"
I have been using them for a few years. I can honestly say I have no complaints. I never really faced any downtime that I noticed. There’s a reason why HostGator takes up 1% of all Internet traffic. It services websites big and small and provides convenience for webmasters of all skill-levels . Whether you’re starting out your first blog, want to make some money through resells, or if you’re out to create the next Amazon.com, HostGator has a package waiting for you. Like Hostgator Review? Visit Hostgator. Oliver is a senior web developer who develops features and directs maintenance tasks for the WebsitePlanet website and associated Android apps (Java and Kotlin). Wondering how HostGator stacks up against other Web Hosting companies? Enter any other Web Hosting company and we will give you a side-by-side comparison.